A little late to this session because the breaks between sessions are a little tighter today so that the conference will be over a bit earlier. It was a lot faster for me to snap a pic of the first two slides as I set up the computer. Oh, and Justin‘s at the podium first. Risk: can Yahoo! stay relevant in search? About 40 percent of Yahoo!’s traffic is coming through a partner network, from their research. There are two mechanisms for adjusting bids. Big the partner network separately or together with the core search asset. Sean is next. 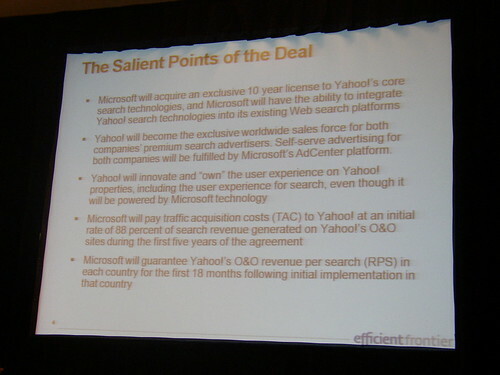 He says that there has been an international roll out of adCenter this week by Microsoft, trying to get into all the markets Yahoo! has been. He’s going to look at the deal from an SEO-focused and tool-focused point of view. Bing takes over site explorer. 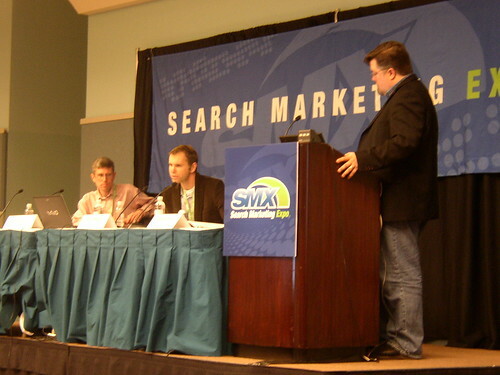 It might happen because it would engender goodwill from search pros. 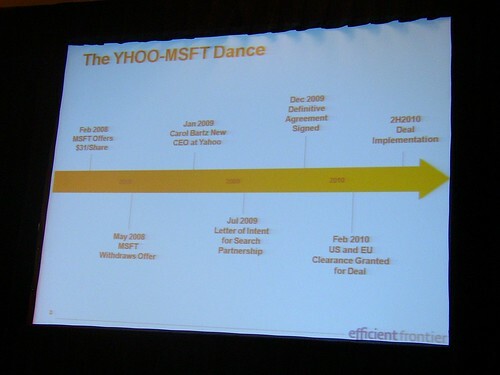 However it might not happen because Bing removed support for link operators in March 2007. If Site Explorer shuts down, what are the competitive link data alternatives? Task is immense and few are up to it. There are more than 300 billion Web pages to crawl. Yahoo Site Explorer is most generous source of link data. Bing and Google offer data for our sites. Google offers link: operator. It shows a subset of links Google knows and that can mislead people who aren’t in the know. Alexa, an Amazon.com division, offers various internet data and stats. Microsoft has a desktop, on-site SEO toolkit. Think it will stay around? Sean says that the problem with desktop tools is that they only work on Windows. It looks like Google is trying to move advertisers to the web interface from the stand alone. He thinks tools are going to have to be offered in a browser interface, or else a truly cross platform solution. Sean recommends visiting the Microsoft adCenter site. He fears that there will be delivery stuff using Silverlight, which may not work on Linux. There are conflicts between what they’re trying to push. Will ad costs go up because of this deal? Justin sees this being a possibility. More volume should mean greater depth of advertising which means higher CPCs. Sean says that outside the U.S., where Google has 90 percent of the market, regardless of Microsoft Yahoo making a less competitive landscape, unless something happens Google will still be dominant.